The word kü means upright or vertical. It also means to stand, to go up and out, and to rule. It is also the abbreviation of the name of the Hawaiian war god Kükä’ilimoku. The word kua or kuamo’o means backbone or spine … literally the “backbone of the lizard guardian”. In Hawaiian thinking our ancestors are always present with us, and during certain situations it behooves us to be aware of this fact. The way the spine is held is importance when accessing non-linear states of awareness.. The sphenoid bone, called Iwi ‘Öpe’ape’a (“bat bone”) rests at the base of our skull and is the platform upon which our brain sits. The relative position of the sphenoid bone may be important in allowing the free flow of cerebral spinal fluid that bathes our spinal cord and the electrical impulses in our nervous system. When the spine is lengthened and the cervical curve is flattened, a number of things happen, including the stretching of the vagus nerve. In addition to the neck, the lumbar curve also needs to be flattened in order to facilitate the flow of Qi. 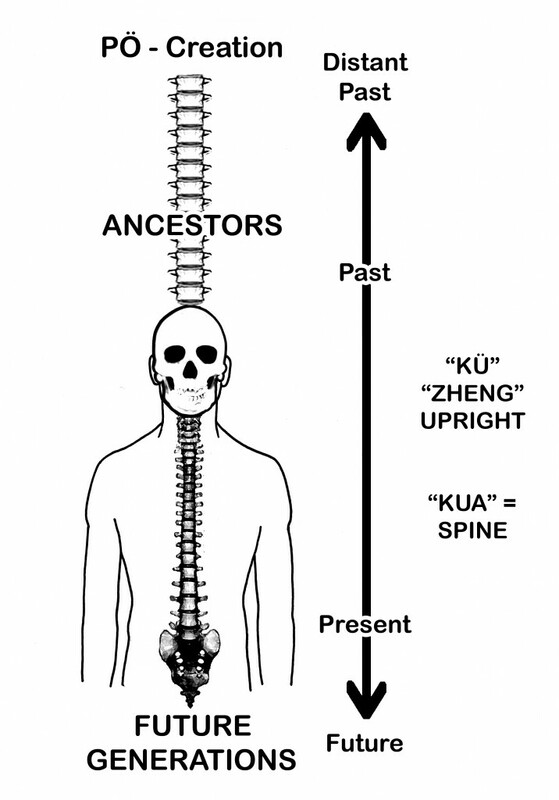 When the spine is as long and relaxed as possible we are aligned toward Heaven, aligned with Pö, aligned toward the ancestors. In developing wild wisdom and deep listening skills, we must learn to use specific parts of our body in different ways. Many traditions distinguish three centers of thought or emotion, the head, the heart, and the gut. Each of these serves a different function for us as we relate to the world. We think from our head. Symbolically speaking, the head is our linear mind, the seat of logic and linear thinking. My Hawaiian teachers always said that the head would fool you, but that the na’au, or intuitive belly would never betray you. They observed that the lower belly to be an accurate place from which to navigate in the world; that it reveals a more reasonable representation of what is happening around us. In traditional cultures there is often a focus on bringing awareness down from the head and into the torso and abdomen. This sometimes is directed to the chest, but more often the awareness is moved lower into the belly. A portion of the parasympathetic nervous system is mediated by the tenth cranial nerve, also known as the vagus nerve. The vagus nerve emerges from the brain stem and connects with the larynx, the heart, the digestion, and parts of the reproductive organs, spreading throughout the lower abdomen. We speak from our heart. Yep, not from the larynx… from the heart. Do you know how people say “He’s all heart”, or “She has a heart as big as the sky”. We understand intuitively what they mean. Someone who speaks from the heart is often the kind of person who lives transparently and without shame. They usually reveal themselves without apology or arrogance. In some traditions the upper torso (solar plexus or heart center) is the region from which we speak our clearest and most profound truths. Speaking from our heart is different than speaking from our head. Speaking from the heart involves an internal commitment to hearing ones own visceral and somatic responses and validating them, and communicating them clearly but without malice. These responses can be commented upon by the thinking mind, but never trumped by it, at least not in maters of consequence. When we say that we know something “in our guts”, or that “deep down we knew what was happening” what does it mean?. It means that we have the ability to listen from our belly. Many traditional practices present this accessing of one’s deeper self and intuition as a somatic process. People in traditional cultures understood that the best way to reconnect with nature, the universe, and each other is through the center of our body, through the “root” of our awareness. Because the information we gather in such a state is unfiltered through our layers of conditioning, it can be a more direct way of knowing. In a practical sense what this means is that we must access the world through a different part of our nervous system than the one we normally use. To experience deep listening we must go back in time to experience the world in a way that is pre-intellectual … a world we experience through our skin, through our organs, through our viscera. Our pre-intellectual heritage involved using our instincts, our somatic perceptions, to guide our behavior. This is a visceral, non-cognitive process. Our heart-mind and our belly-mind are what remain of our deep inherited instincts. We use them as much as possible when we are involved in deep listening. We can use our belly mind when we are listening to the forest, a stone, a thunderstorm, or a loved-one. Many traditional societies have a specific term for the lower abdomen. In China it is called the “dan tian” and in Japan the “hara”. My Hawaiian teachers referred to this area in the lower abdomen as “na’au”. In Chinese, the term dan tian means “elixir field”. The character dan implies a precious medicinal substance and also an alchemist’s furnace. So this elixir field is a place in which powerful realizations and transformations can occur. Interestingly, this area is also called “ming men” which means “gate of destiny”, implying that through accessing this part of our body we might align ourselves with our true nature and calling. In Japanese, the word hara means “field”. In the Japanese meditation practice of zazen, the fingers and thumb are formed into a circle in front of the hara. This practice brings one’s attention and awareness to the lower abdomen. In Hawaiian, the word na’au means the guts, the viscera or intestines, specifically referring to the lower abdomen and the area around the navel. But the word na’au also has a deeper meaning; it means knowledge. One perceives or knows (‘ike) with one’s na’au, but it is an unusual kind of “knowledge”, a deeper and somatic knowledge rather than an intellectual one. There is another Hawaiian word: “ao”. The word ao refers to light as in daylight, but also to a spiritual light. So if we take the word na’au and we add the word ao (i.e., we shed “light” on our “knowledge”) we get the word na’auao, which is the Hawaiian word for wisdom or enlightenment. This implies that if we bring self-awareness to our na’au over time we might shed light upon our knowledge we may access our wisdom, or even enlightenment. We access our na’au while in the forest in order to active those long-dormant parts of our nervous system, to see, feel, and express in ways that reflect who we are at our core, without all our cultural and intellectual overlays. 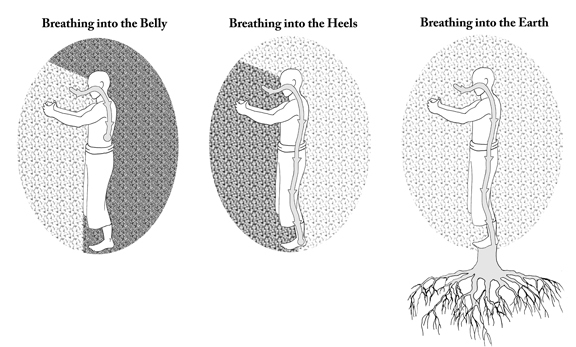 When we are in Hakalau (not moving) or Hakahele (moving) and we are breathing into our belly, most of our attention is involved in searching for movement and sensations through our peripheral vision and tracking the sensations in our abdomen, and on our skin. We may forget that there may be things going on behind us worthy of our attention. When we breathe into our heels, we activate the meridians that run up the back of our body and over the top of our head. This allows us to more easily pay attention to what may be happening behind us. There is another option open to us. We can breath into the Earth, or feel the Earth breathing into us. From this perspective our awareness can encompass both the “oval” shape defined by our front facing peripheral vision and an awareness to the rear. This can create a “sphere” of our awareness that encompasses all three dimensions. Because we spend so much time in our thinking mind, much of our energetic life force moves upward in our body. This works well while calculating mathematics but is much less effective for listening to the forest. When we are gathering plants and find ourselves too much in our head, we can use a “rooted gait” to bring awareness back down into the Earth. • Find an open flat area where you can walk. • Wear comfortable clothing and good shoes if you need them. • Begin to walk as if you were a non-human primate, a chimpanzee or a gorilla. • Allow your arms and hips to swing naturally and keep your knees as bent as is comfortable. You want to feel the weight of your body upon your legs and the Earth. • Feel your center of gravity sway with each step and the way your upper body and lower body movements compensate for each other. • If you want to, you can combine the Rooted Gait with the Dermis exercise or the Hakahele practice.